In 2006 and early this year, Consim Info sold undisclosed stake to Internet company Yahoo! Inc., and venture capital firms Canaan Partners and Mayfield Fund for $20.4 million (Rs92.62 crore today). The subsidiary would look at raising around $5 million, said founder and chief executive officer Murugavel Janakiraman. “We are currently the No. 4 in the jobs portal space," he said. “We don’t want to be yet another player, we want to be the leader." Jobs, along with classifieds, matrimony and auto portals have largely driven India’s Internet business. Info Edge (India) Ltd-owned Naukri.com, Monster Worldwide Inc., Timesjobs.com and Shine.com are the main companies competing in the online jobs portal space. Shine.com is part of HT Media Ltd, which also publishes Mint. Besides raising funds for its job portal business, Janakiraman said the company was re-working its business model, without elaborating. He said the new strategies would “be rolled out in the next 45-60 days". Venture capital firms have invested $543 million spread across 98 deals in India between January and December 2007, according to Venture Intelligence, an information and networking services provider to private equity and venture capital investors in India. “Each of them is a leader in the space they started in," said Arun Natarajan, founder and CEO of Venture Intelligence, citing examples of Consim Info being the leader in matrimonials and Info Edge in jobs. “And, each of them (companies that own and manage online portals) are expanding into other turfs." “From the point of view of a venture capitalist, (the hiving off into a separate company) will be good as it would be focused on a vertical. It would be easier for a venture capitalist to exit," Natarajan pointed out. “Also, I don’t think raising of venture capital funding would be an issue. 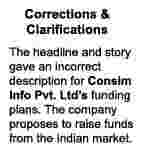 There are many India-dedicated funds sitting on a lot of money and companies with a good track record like this (Consim Info) will be viewed favourably," he added. Currently, Consim Info’s jobs portal has a database of two million registered members, the company says, and Janakiraman estimates the online jobs market is worth $100 million. He expects the process of setting up the company and the fund-raising process to be completed by the end of December. Janakiraman said he is not yet in talks with any investors, but added that they would get an (eventual) representation on the subsidiary company’s board. He admitted the jobs portal is not yet making a profit, and expected it to post marginal gains by next year.